Ha, made you look! With the upcoming movie and all you should know by now that almost every article with the words Star Wars in it’s title is purely made as clickbait. So this new Wilco album is just that? Well, it could be. Jeff Tweedy, Wilco’s lead, however recently told the press he has no interest in Star Wars the movie at all. “In fact, I didn’t even know there was a new Star Wars [The Force Awakens] movie coming out until my lawyer told me. Everybody advised me against it, because there is a heavily protected trademark involved”, so he said. 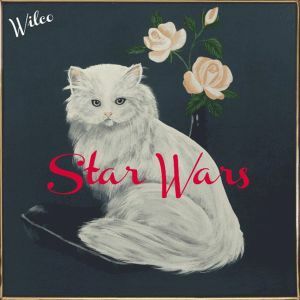 Also none of the songs on the album are about Skywalkers, Jabba the Hutt or Yoda and moreover, the album cover is copy of a simple painting of a cat that hangs in the Wilco studio. Indie rock, Star Wars, a cat… nope, can’t connect the dots here. Deliberately trolling fans of the overhyped science fiction movie or not, this summer Wilco decided to surprise release Star Wars the album and making it free to download for a limited time. It seems The Force works in mysterious ways yet again. Wilco has quite a stature in the alternative rock scene, putting out the one high quality album after the other. From the 1990’s on the band’s musical style evolved from country rock to a more encompassing form of indie rock that taps into several pop and rock eras. In 2002 they experienced their greatest success with Yankee Hotel Foxtrot (2002), an album that is widely seen as one of the best the indie rock standards from that period. Star Wars’ eleven tracks are probably the most easy accessible I’ve heard in a long time. It’s predecessor, The Whole Love (2011) was too polished to my likes and therefore I was glad that from the first moment on Star Wars proved to be more rough edged and reminds of the Wilco that started from the leftovers of Uncle Tupelo 20 years ago. During the openers ‘EKG’, and ‘More…’, that flirts with the monumental Abbey Road, the loose ramshackled sound from back in the day is eminent. This continuous of the self assured sounding tune of ‘The Joke Explained’ which is followed by the darker ‘You Satellite’, a hypnotic track that is filled with surging guitars in a manner we know from Sonic Youth. It’s exactly this manner of combining looseness and seriousness the band masters to perfection. On the second half of Star Wars the band moves onward with the sheer delicateness of ‘Taste the Ceiling’, a track that just as easily could be a part of the Sky Blue Sky record from 2007. Without any effort the band shifts their attention to some light stoner rock on ‘Pickled Ginger’. Nicely enough it stays by a touch of Queens of the Stone Age though. The heavy guitar rock sound remains easy but the outline of the songs still commands your attention. Near the end the band maximizes their familiar sound on the finespun ballad ‘Where Do I Begin’ and again refers to The Beatles with ‘King of You’ and the album’s upsurging magnum opus ‘Magnetized’, which backdrop sounds like a ticking clock that accepts time slowly moves forward. Wilco’s ninth yet again unwinds in a display of their splendid musicianship. This time around the carefree moments are not only there the create the ideal ballad but are mainly there to give way to the rougher edges of the band. For this reason alone Star Wars is a joyful album to listen to. Maybe we’re dealing with a reawakened joy of Tweedy here who recorded a very personal solo album last year with is teenage son Spencer Tweedy on drums. Unfortunately this latest Wilco effort is also their shortest, clocking at about a half hour and only one song going over four minutes. On the other hand Wilco doesn’t need a lot of time to show that their still a relevant factor in the scene, from here to the Outer Rim territories that is. Darn it, the free digital version of the album isn’t available anymore. So you could check out this YouTube stream above and/or just digitally purchase the full album from the Star Wars store, including audiophile FLAC and ALAC versions. It’ll also be available at record stores everywhere on August 21 (CD) and November 27 (vinyl). This entry was posted in WRM and tagged 2015, Abbey Road, album, cd, country rock, Dark Side, dBpm, Indie rock, Jabba the Hutt, Jeff Tweedy, Outer Rim, Queens of the Stone Age, Sky Blue Skly, Skywalkers, Sonic Youth, Spencer Tweedy, Star Wars, The Beatles, The Force, The Force Awakens, The Whole Love, Uncle Tupelo, Yankee Hotel Foxtrot, Yoda. Bookmark the permalink.